As a global initiative, Council members represent a diverse array of cultures, geographic locations, ethnic and religious backgrounds, political perspectives and professional competencies. Individuals invited to serve as CWFL Advisory Council members typically include leaders from the public, non-profit and private sectors that have demonstrated personal distinction, leadership, and a commitment to building the capacity of women of faith in order to ensure that these women, with full agency as equal citizens, are equipped and empowered to serve as leaders and agents of change-across vocations and locations; and, on the world’s most pressing socio-economic and geo-political challenges and conflicts. Click here to read more. 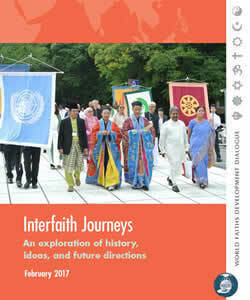 ​"Interfaith Journeys: An Exploration of History, Ideas and Future Directions"
Interfaith initiatives reflect many social and religious ideals, but they respond above all to the cruel violence, tensions, and polarization of our times. Interfaith efforts seek immediate action to confront threats and they address root causes of tensions, especially those that touch on religious beliefs and practices. They work to realize the potential richness of plural societies and to breathe life into human rights. Interfaith work seeks strength in shared values and goals and explores ways to bridge deep social and political divides. This project explored the complex landscape of initiatives that involve interfaith, multifaith, intrafaith, and other purposeful efforts involving dialogue and action with a religious inspiration. The initiatives are bewildering in their diversity and in their response to forces of change. The report thus introduces a complex field and takes stock of institutions, successes, and challenges. It offers a map of the history, intellectual foundations, and major features and actors involved in interfaith work. And it sets out, and solicits, ideas on priority areas for future action. Download PDF here. 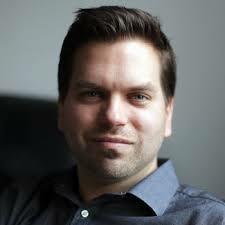 Want to Connect with or Invite a Council Member to Speak at Your Event? Contact Us! Kristen Lundquist is the Program Director for the Center for Women, Faith & Leadership (CWFL) at the Institute for Global Engagement. In this position, Kristen engages and advises on issues at the intersection of religion, gender, and security within IGE broadly; and manages practical programming for the Center, including the Religion, Gender, and Identity Initiative, and the CWFL Fellowship Program. Prior to her tenure at IGE, Kristen served as a consultant to numerous women's NGOs in the U.S. and the Middle East, for program management, research and analysis, development, and communications. Kristen holds an M.A. in World History from Eastern Illinois University, a B.A. in Ancient History, and a B.A. in Biblical Studies with a focus on Near East Languages from Northwestern College. With the view of aiding women of faith affected by PTSD as a result of violent conflict and war, Kristen is pursuing an M.A. in Clinical Mental Health Counseling from Messiah College. She has served as a Pastoral Counselor for Church of the Advent in Washington, D.C., and currently serves as a psychotherapist at The Women’s Center in Vienna, VA. Taking her passion for women’s trauma healing into the local community, Kristen has also helped form Church of the Advent's shepherding / lay counseling ministry in Washington D.C.; she has designed and facilitated a community-based “Prayer & Movement” yoga therapy; and, she has served on the Washington, D.C. Advisory Board of Amani Ya Juu, a women’s stitching, empowerment, and peace-building project based in East Africa. Prior to joining IGE, Dr. Weber served as Dean and Professor, Graduate School of Education and Psychology (GSEP), at Pepperdine University. Dr. Weber developed global programs, including an international leadership course in the Organizational Leadership doctoral program, the Global Leadership Internship in the Social Entrepreneurship and Change master's program, and Aliento, the Latino(a) Center for Mental Health which incorporates therapy in Spanish speaking countries. She led student groups on educational/immersion trips to India with a focus on Corporate Social Responsibility; to Kenya to partner with NGO's for responding to teen addiction in the urban slums; and to Ethiopia to partner with a faith based group serving in the government projects to educate youg children. 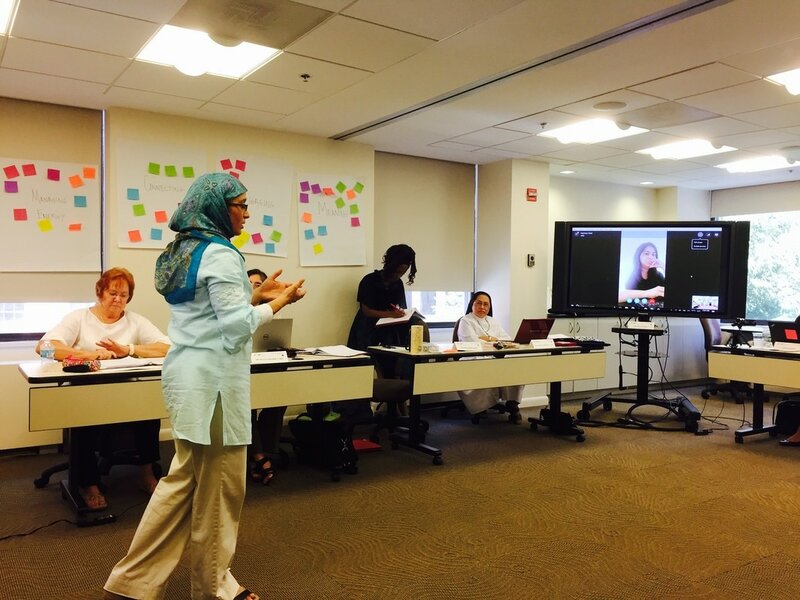 For the past 25 years, Afeefa Syeed, a cultural anthropologist, has designed and implemented initiatives and training to address engaging traditional and religious leaders and institutions, human rights, radicalization, socio-political identity, and social entrepreneurship, among other emerging issues. Her work includes religion and development, gender inclusion, countering extremism and integrating cultural context into development and diplomacy. Afeefa, who most recently served as Senior Advisor at the U.S. Agency for International Development (USAID), is presently a Scholar Consultant for the Carter Center, and Research Associate with Cambridge University’s Institute on Religion & International Studies. She has advised the White House, National Security Council, Department of State, UN Democracy Fund, World Bank and various in-country government and non-governmental institutions on the same issues for communities in Europe, Southeast Asia, South Asia, Central Asia, and Middle East and North Africa. She is a member of various interfaith, social service and advocacy organizations in the US.